Our sedimentation process leads to a very homogeneous layer structure. To guarantee a homogeneous layer structure, at least 3 to 4 layers of phosphor grains are necessary. The minimum average grain size available is 1 µm. The maximum thickness of the phosphor coating is up to ca. 50µm. The resolution limit RL is defined as the spatial frequency resulting in a modulation transfer function MTF with a value of 3%. RL is measured in linepairs/mm (lp/mm) and can be approximated as RL = 500/D. Up to 100lp/mm are possible. 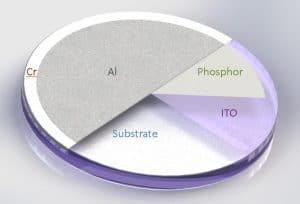 Efficiency does not only depend on the type of phosphor but also on parameters like grain size, layer thickness, aluminium reflection layer and special manufacturing parameters like thermal processing. It can be reduced by the presence of alkali ions. Efficiency of phosphor screens in proximity focus image intensifier diodes exposed to 6 keV, 10 keV, 12 keV and 15 keV electrons (screen thickness ca 4-5 µm, grain size ca. 1 µm, aluminium reflection layer). Please note that these screens are sedimented on fiber optic plates, which means that with plain glass the efficiency will be even 40% higher. ProxiVision offers the conductive underlay coating of substrates with indium tin oxide (ITO) to reduce electrostatic effects on the screen caused by charged particles. Standard and special conductive parameters can be achieved. To allow direct electric contact to a phosphor screen, a chromium ring of width up to 100 mm diameter can be sputtered on the outer area of the substrate. This is needed in the combination with ITO coating to reach position independent brightness of the screen fluorescence caused by charged particles. 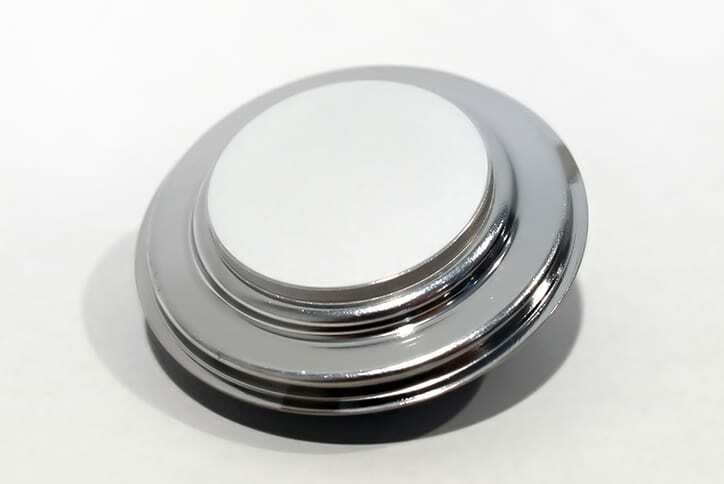 To increase light efficiency by up to 100 %, it is advantageous for most applications to seal the phosphor coating with an aluminium layer on top of it. As a standard, a 40 nm to 50 nm coating is recommended, but on special request the thickness can be varied between 5 nm and 130 nm. The aluminium is a conductive overlay and cuts off light background in the system. The brightness is increased when used with electrons of more than 4 keV. In case of use with electrons below 4 keV no increase is achieved. To improve the mechanic stability of a phosphor screen, water glass can be added during the sedimentation process. A screen manufactured this way can resist a light finger touch. An efficiency decrease of 30% to 40% results from this manufacturing process as the density of the phosphor grains in the matrix is reduced.